Mid-Southerners have gotten a treat over the last couple days when it comes to the weather, thanks to some cooler temperatures and lower humidity, making for some very enjoyable afternoons and evenings. However, as you might expect as we head towards Memorial Day weekend, this pleasant weather will soon be over. Get the sunscreen and swimming pool gear out because the heat takes over in the coming days with record temperatures looking increasingly likely by this weekend. So what will cause this stretch of heat? 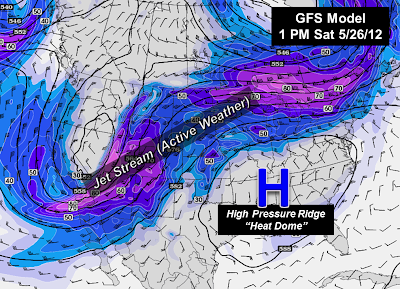 A building high pressure ridge at the mid and upper levels of the atmosphere will set up directly over the region, creating a “dome” of heat that will cover much of the Southeast U.S., but especially the Mid-South. This high pressure ridge will block any rainfall or significant cloud cover from developing, allowing the heat to continually build through the weekend. A high pressure ridge of this strength normally isn’t a factor in our weather until the middle of summer, thus the near-record temperatures we are expecting. As depicted by the GFS model - the high pressure "heat dome" will park itself over the Mid-South for the weekend. Active weather will be hundreds of miles away. In addition to the heat, the stagnant pattern the high pressure ridge will produce may also create poor air quality issues. As winds remain light this weekend, the atmosphere will not be able to “mix out” various pollutants that build up through the day. As a result, more “Code Orange” days will be possible, particularly on Saturday, Sunday, and Memorial Day. That may make prolonged outdoor activities in the afternoons and early evenings unhealthy, especially for those with respiratory diseases like asthma. Fortunately, there is some hope for relief in the foreseeable future. It appears the high pressure ridge will begin to break down late on Memorial Day but especially Tuesday into Wednesday as a new storm system and associated cold front begin to approach from the west (see graphic below). This should allow for increasing clouds, some rain chances, and slightly cooler temperatures to filter back into the area for the middle of next week. With hot weather arriving just in time for Memorial Day weekend, and many of you likely planning outdoor events, be sure to plan appropriately for this early bout of summer heat. 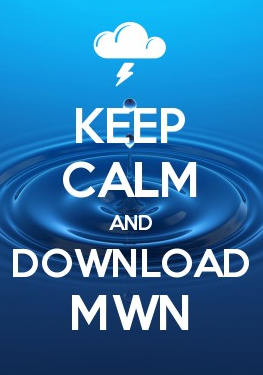 You can find a few heat-related safety tips in this MWN Blog post.This is particularly true given the possibility of poor air quality. You can learn more about poor air quality and it's effects on sensitive groups, as well as find additional links in this previous MWN Blog post. MemphisWeather.Net will keep you updated over the next several days, including passing along any air quality alerts that are issued.